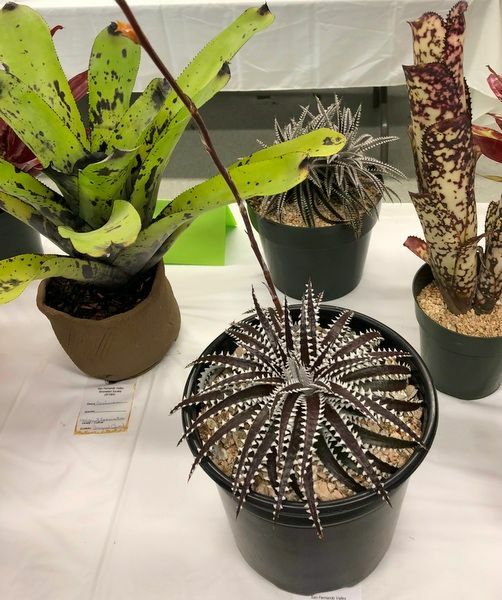 Dyckia ‘Uncle Ray,’ Exhibitor Bryan Chan, (San Fernando Valley Bromeliad Society) won best in its class at the recent World Bromeliad Conference in San Diego, or so I was told by a docent at the Los Angeles Cactus & Succulent Society Annual Drought Tolerant Plant Festival this past weekend. It seems like there’s a show and sale every weekend now, and you can keep current by checking this link here. 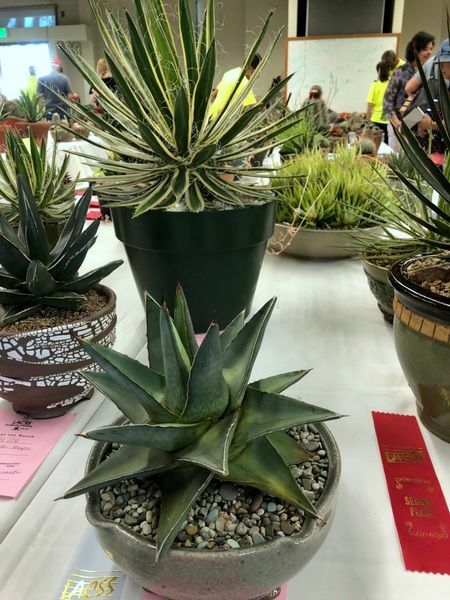 The huge Intercity Show & Sale August 11 and 12th at the Los Angeles Arboretum is one I don’t want to miss. Wagon, camera, cash — I’ll be ready next time. On Saturday, shopping started out very promising at a table loaded with bromeliad pups, where I was reeled in by a good-sized offset of Neoregelia ‘Apollo’s Poetry’ (which name puts me in mind of a favorite Bjork song “Pagan Poetry.”) Unfortunately, the bromeliad table is also where shopping for me ended, as this entire sale ran on cash only, and I was as usual cash poor, reliant as I always am on plastic. Pathetic, right? 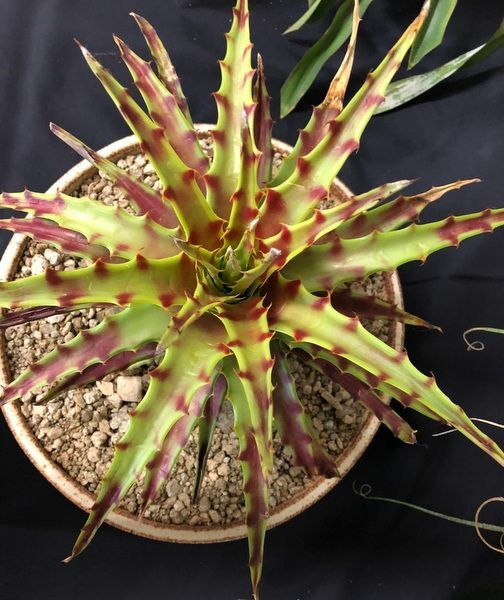 In fact, so pathetic a gentleman offered $5 to make up the difference on a Bilbergia ‘Pink Champagne’ I was loath to give up on, frantically emptying out my pockets for a few stray dollars. (And I am chagrined to admit I accepted the $5! Bless you, sir!) Still it was a great time, with so many beautiful plants to ogle at the sale and indoor show, so I figured I’d switch my energies to photos…but left my camera at home. 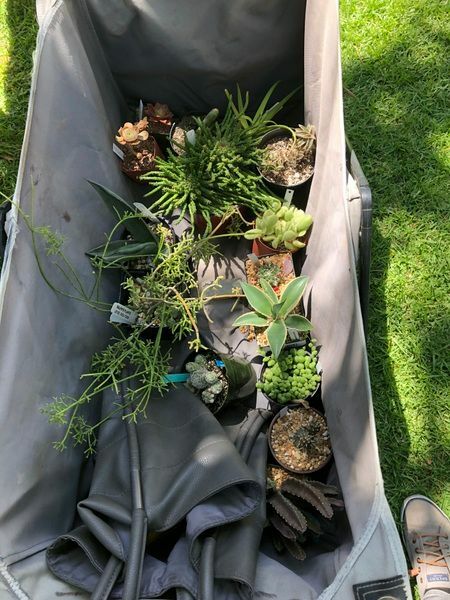 Sans camera or cash, I wandered the sales tables for quite a while, thinking that if I found an Aloe broomii or nice specimen of Euphorbia cooperi I’d run out to find an ATM. Neither of those surfaced, but I’m glad I stuck around because a very nice person named Heather recognized me somehow from the blog and introduced herself. I did grab a dozen or so photos with the camera phone, like this hechtia with a tart mix of colors reminiscent of limes and salsa. 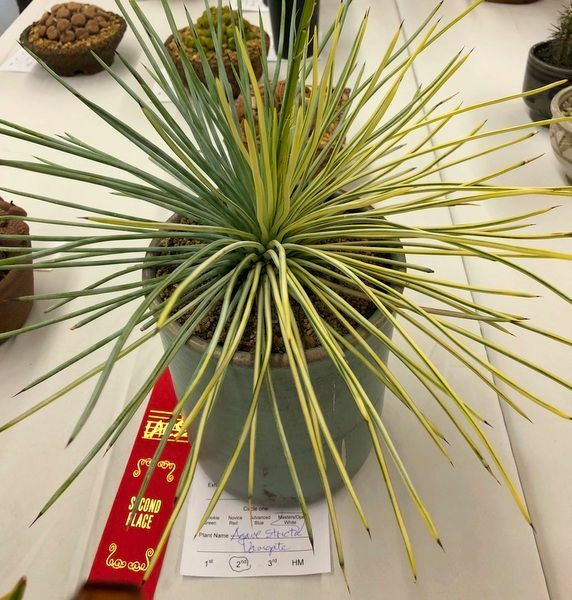 Loved this variegated Agave stricta, which was in bloom. And this is what my Agave ocahui aspires to be — pristine, no leaf tip burning. Copiapoa columna alba. 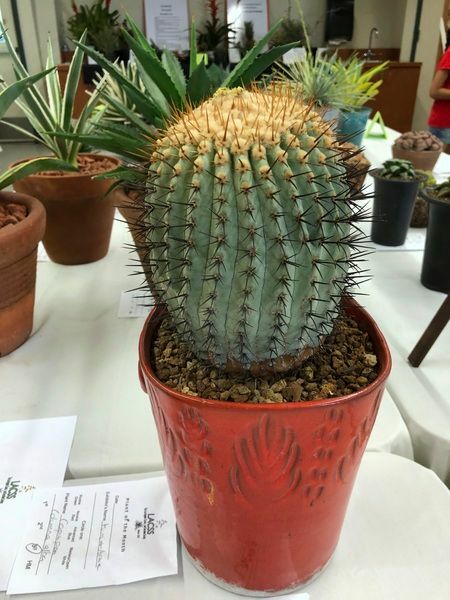 This Thursday, on June 14, Kelly Griffin will be giving a presentation on these Chilean cacti entitled “Copiapoa Land” at the next meeting of the San Gabriel Valley Cactus & Succulent Society, LA County Arboretum, 7:30 p.m., Ayres Hall. 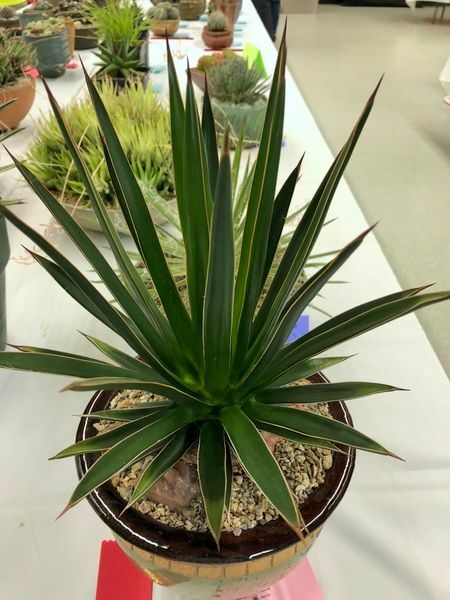 This entry was posted in agaves, woody lilies, clippings, plant sales, pots and containers, succulents and tagged 33rd Annual Intercity Show at LA County Arboretum, Copiapoa columna alba, Dyckia 'Uncle Ray', Kelly Griffin, LACSSA Annual Drought Tolerant Plant Festival, Neoregelia 'Apollo's Poetry'. Bookmark the permalink. Love the Hechtia even if it looks like it has a vicious side. I’m glad you ran into not one but 2 great plant people. I guess the plant show vendors haven’t yet got the word that we’re becoming a cash-less society (as I learned recently when I tried to use cash to pay for my lunch at Tender Greens). Sigh to cash only sales! I know why they do it, but still… You still got nice pictures even without the big camera. That hechtia is gorgeous! How fun to meet a reader and co-enthusiast! Heather, let me second Denise’s urging that you blog; to judge from the nice haul in the wagon, it would be a pleasure to get a look at the plants they’ll be joining. I had so much fun Saturday and it was great to meet you. You’ve inspired me through the course of reading your blog to try a bunch of new plants that I have admired. Hope to run into you at another show!